Nextdoor is the best social media network for neighborhoods around the world. It’s private and for verified neighbors only. That means it’s a treasure trove of connecting and doing business with neighbors. But how do you promote your business on Nextdoor? Nextdoor is has many options they’re exploring for promoting your business on Nextdoor. One of the earliest methods I explored for this is posting a business event in the events section of Nextdoor. You have to post your event properly so it doesn’t get rejected (and you potentially reported) but it’s a good option for connecting with neighbors. I’ll get to that in in just a bit. Before I get into posting an event on Nextdoor, there’s also a newer method for promoting your business on Nextdoor called offers. It’s still in pilot which means you may not yet have access to it but it will come. You can read more about promoting your business on Nextdoor with offers on the blog post I wrote. It’s the first time a business can post directly to the Nextdoor feed. If you’re going to post an event (which I still do recommend!) then there’s a lot more you need to know than just to go create an event though. If you jump right into it without learning about the right way then your event will get removed and again you’ll end up with a tarnished reputation in the local community. I’m assuming that you’ve already set up your Nextdoor business page. That’s an important part of having your business become part of the local Nextdoor community. Also, getting more recommendations on Nextdoor is important because that’s how your business can be shared in the Nextdoor main feed by your neighbors. Of course, your business reputation matters everywhere so be sure you have a holistic approach rather than limited. 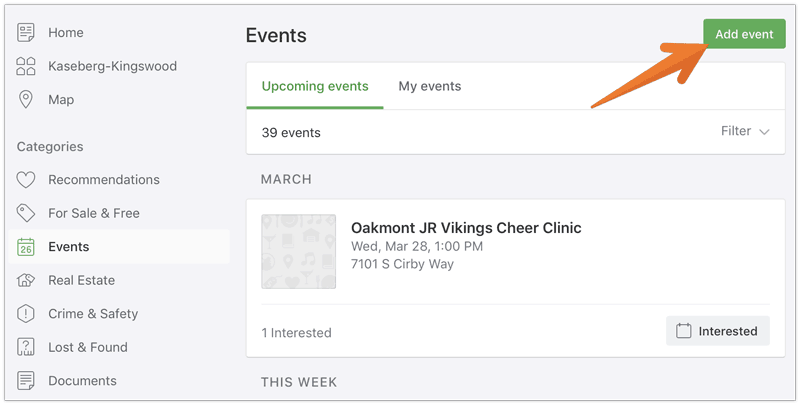 So, read on to learn about how to promote your business on Nextdoor with events. Before you do that make sure you also explore what the opportunities for advertising are on Nextdoor in case you fit into that category. There are two groups of businesses which can advertise on Nextdoor. Your business likely doesn’t belong to the first group so that leaves only one business type in the local community that can advertise. You’re a national big brand. You’re a real estate agent or broker. You can learn all about advertising and how to do it in the post I wrote about advertising on Nextdoor. If you’re not a real estate agent or broker then you’re out of luck for advertising on Nextdoor. That doesn’t mean you can’t promote your business on Nextdoor though. If you get creative with events and do them correctly then you can promote your business and connect with neighbors. I have heard from several people who have noticed business events on Nextdoor. It came to my surprise that this isn’t entirely against the Nextdoor policy and is actually recommended by Nextdoor. If you post a commercial event on Nextdoor the right way then there’s absolutely nothing wrong with it. Your event does have to be an actual event though so you can’t use events to simply promote your business. If you’re doing something cool in the neighborhood then share it with the community. What are some things you can post as events? It’s a great way to make a connection with the community and reach new people who would otherwise never know your business existed. They don’t have to be free but you do have to provide something that makes people want to go. 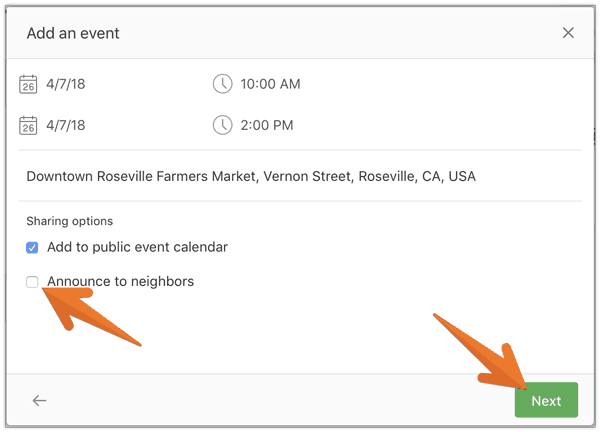 You are allowed to share commercial events such as happy hours and concerts, real estate open houses, and classes that charge fees to the public Event Calendar on Nextdoor. There is one catch. You have to post it the right way or you risk getting the event removed. I’m not sure if worse can happen but I wouldn’t test it if you want to keep your business honest and upstanding in the community. These are your neighbors after all. So, how do you post an event the right way on Nextdoor? There is a right way to post commercial events on Nextdoor and there’s a wrong way. Be sure you brush up on the right way to do it or your event will get deleted. Not only will it get deleted but you risk diminishing your business standing in the community. There are some guidelines for posting an event to Nextdoor such as the over-posting guidelines that you must follow. Beyond that, you just need to post commercial events in the correct way so they don’t get taken down. Yes, don’t announce it to your neighbors or it will get removed. Announcing an event to your neighbors is the incorrect way. I know you want your event to be seen as widely as possible but it’s just too much according to Nextdoor. People who browse the events section will see your event and that’s as good as you can do. Here’s how you add a commercial event the right way. You can only post commercial events from a computer. Nextdoor doesn’t allow you to disable neighbor announcements in the mobile app for iOS or Android. So, you can post a commercial event from a mobile phone but since the app doesn’t have the proper settings it will be promptly removed by Nextdoor and/or reported by neighbors. So, head on over to the events page on your computer only. You’ll see a button above the events feed to add an event. Click that to open the add event pop-up. Now you have to put in all the correct information. 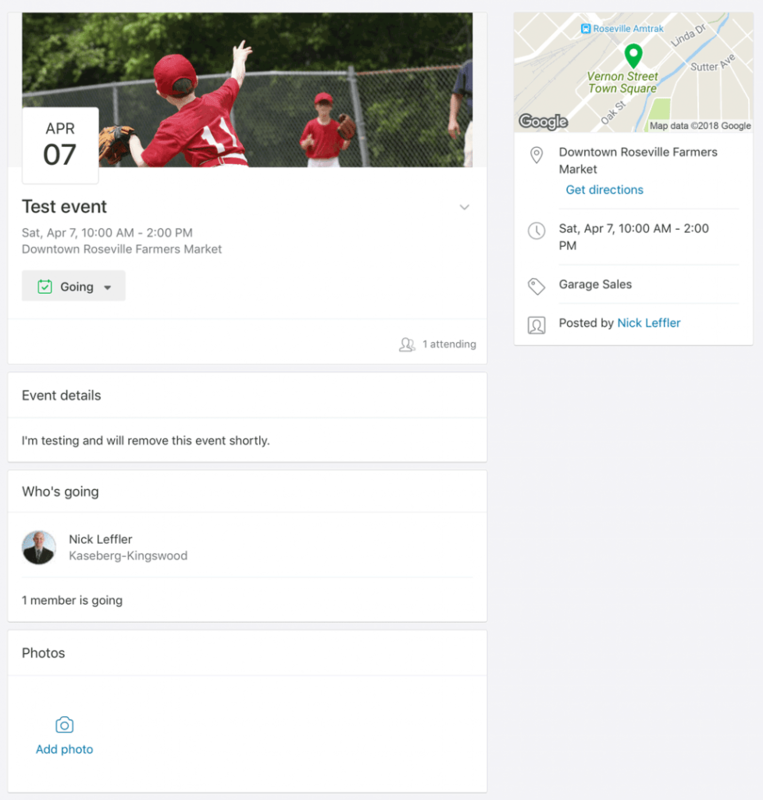 You can post your event to your immediate neighborhood or your neighborhood + nearby. Either option is okay by Nextdoor so I recommend the one with the biggest reach if you’re trying to promote a business event. You can select the type of event it is. Be as accurate and truthful about the event type as possible. Select the correct one and only use other if it doesn’t fit into any other category. There are a lot of categories but of course, your event may not fit into one perfectly. Whether your event fits into a category neatly or not, your event title is going to be even more important. This is what tells people what your event is really about. Don’t try to squish too much information in here, just the basics that tells what the event is so people know if they’re interested or not. The description is the place for the details of the event and to tell who’s welcome, what to expect, and all the juicy details. You can keep the box selected at the bottom if you want to be notified of RSVP. I think this is a good idea so you know who’s interested and can keep tabs on your event easier. Once you get all that filled in click the next button and be very careful about the next step. There are a few more details you must fill in here such as the date and time of the event. The first two options are pretty basic. Make sure you put the exact location of the event. The last section is the most important for your commercial event though. Make sure you un-select the Announce to neighbors option. If you leave this option selected your post will be removed and if you do it enough you could get banned from posting events. DO NOT announce your post to your neighbors if it’s a commercial event. As far as I can tell you’re allowed to add your event to the public event calendar though. Nowhere in the Nextdoor commercial event instructions does it say you’re not allowed to for commercial events. The reason you should not post your event on your mobile device is that it doesn’t currently have the option to unselect the announce to neighbors option. Once you’ve filled everything out and un-selected announce to neighbors just click the next button. After you click next you can add a picture to your event. To help your event stand out more and look better, upload an image. Just like on other social media platforms, images help your event stand out. You can use one of the optional pictures Nextdoor offers but I would recommend uploading a custom non-spam looking image. You can upload an image that is a .JPG, .PNG, .GIF, or .TIFF format and the ideal (but not required) dimension is 700 x 240. I wouldn’t get too wild with .GIF animations if it allows that (I haven’t tested it). 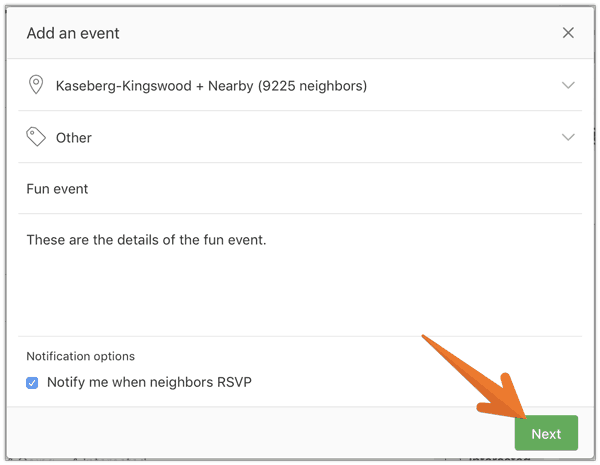 You can see more of the details about what’s allowed on the regular Nextdoor post an event instruction page. 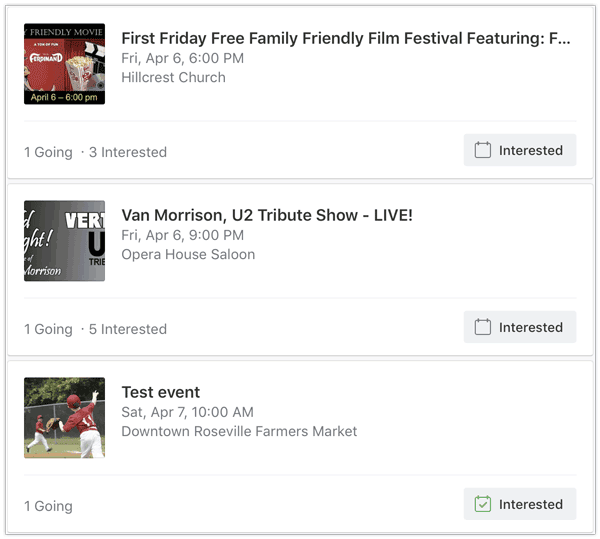 Once you click post your event will go public and be in the public event feed for your neighborhood and other nearby neighborhoods if you selected it. You can see my test even posted in the event feed of my local neighborhood (don’t worry, I deleted it shortly after I capture screenshots). And once you’ve posted the event there are some other things you can do to enhance it even more. This is what the event page looks like that I created. See the add photo button right at the bottom? 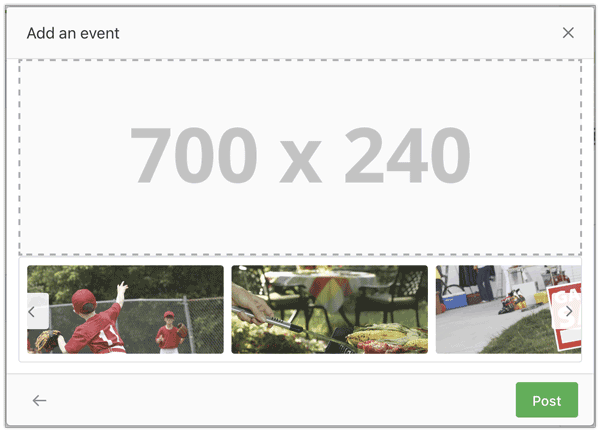 Ya, you can add more photos to your event. That button is also visible to your neighbors so they can add photos of the event also. It’s a good way to get some user-generated content. If you hold similar events regularly then you could encourage your neighbors to post pictures of previous events. That’s a great way to increase local interest and engagement in your business. Yes, Nextdoor limits how a business can promote itself on Nextdoor but events can be fairly powerful. For now, it’s all a local business has so think about how you can make events work for you in a way that’s also helpful to the community. There are always ideas circulating for how to promote a business on Nextdoor. Not all of them are ideal for maintaining a good standing in your community though. Are there other ways besides just events? I don’t know any other way people are using Nextdoor to promote businesses. If you have seen a way then please share. I had someone mention to me that they’ve seen the new interest category used to promote a business. I checked out my Nextdoor and don’t have interests that I could find. That could mean it’s a new feature that’s being rolled out slowly though. If you have seen some creative ways used to promote a business on Nextdoor leave it in the comments. It’s always good to share different ways of doing things. Nextdoor is one of the most trusted forms of social proof I see online today. There are many other options though so be sure you understand the importance of promoting your business elsewhere and getting as much social proof as possible.